For the last few years, every single front page article on GoodGamery has revolved around Magic: The Gathering™ in some way. We’ve touched upon some serious Magic stuff over the years. We’ve done real card previews, in-depth strategy guides, indulged ourselves in Magic poetry and artwork. Now, when you’re reading this, the Magic: The Gathering™ (MTG) content streak has come to an end. In fact, below this paragraph, the article you are now reading will not be related to MTG at all. Ready? 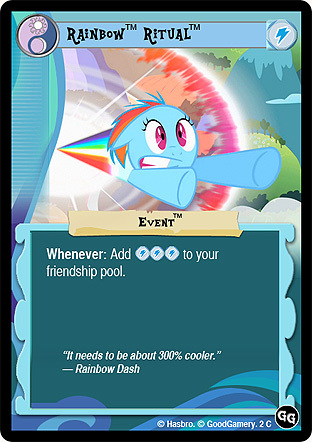 Come follow us into the exciting realm of Equestria™, and another trading card game published under the Hasbro™ brand. 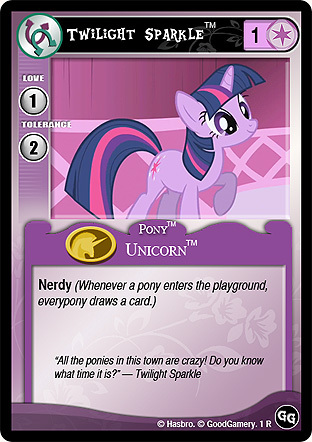 The My Little Pony™ (MLP) collectible card game is based on the popular cartoon My Little Pony™: Friendship is Magic™. The TV series debuted in 2010 and quickly gained the hearts of not only little girls, but those of grown men and the older ladies. A preview version of a trading card game was showcased at BronyCon 2013, and now the full version of the game has been out for a few months. Need we mention that the game has been a smashing success? Each game of MLP represents a story of playful ponies who make friends with each other. Players (or “friends”) employ acts of friendship in order to gain victory points. At the beginning of the game, players shuffle their decks and draw seven cards. Players then take turns; the first player is determined randomly in the opening game. To gain victory points, players must subject their friend (opponent) to fun, which mainly is done with loving ponies or direct fun. Players can also use event cards to change the conditions of the game or play troublemaker cards in order to prevent oneself from having too much fun. After all, if you have too much fun, and your opponent gains 20 victory points – he or she wins the game! During most rounds, players will play ponies and let them make friends with each other during the challenge phase. During this phase, ponies set out to love and tolerate each other – and each pony has a love stat and a tolerance stat. 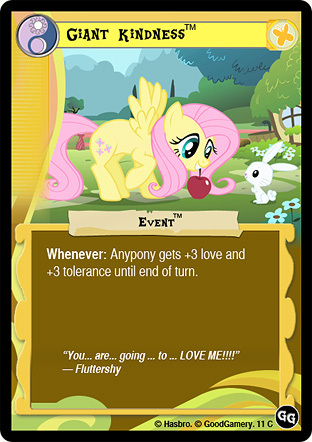 The loving player will announce his or her intent to go forth and love with any available ponies, and the tolerating player will announce which ponies he or she will tolerate those ponies with. Then the ponies have fun with (or strictly speaking, “put fun on”) each other. The love and tolerance stats of said ponies are then compared, and if a pony receives more love than it can tolerate it is loved to death and put into that player’s discard pile. If anypony is not tolerated by another, it will go ahead and let the the tolerating player have some fun. The loving player then gets victory points equal to those love stats. Most cards are played by paying their friendship costs. When you play a card that has a friendship cost, you commit an act of friendship. There are six types of friendship, and each friendship is associated with a color and a pony from the mane cast of the MLP show. Each of these ponies are associated with a unique element of harmony, which means that each friendship has its own characteristics with unique strengths and weaknesses. Friendship flows from resources, which are turned sideways (exhausted). There are six basic resources – one for each friendship and color. By utilizing these resources (turning them sideways), players use the friendships of generousity, kindness, honesty, loyalty, laughter and magic for paying the friendship costs of the cards on hand. Rarity is not only a description of how common a card is, but a fashionable pony. She represents the element of generosity and white is her color. Sometimes giving to others can prevent one from having too much fun, and this phenomenon is called fun prevention (though since having too much fun will cause your opponent to win, this is a good thing). Being fashionable, white tends to be protective of itself, and also values order and etiquette highly. White friendship excels in turning troublemakers, as generosity and friendship will win over the toughest foe. 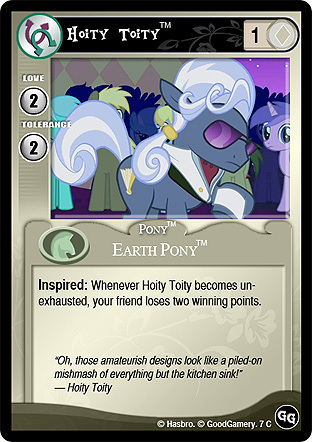 Hoity Toity, above, is a typical white card, and one of the most inspired fashion designers in all of Equestria. Being strictly fashionable, he does makes sure that players don’t have too much fun. Flutteryshy is the kindest pony in all of Equestria. Her color is yellow, which represents the spirit of kindness. Yellow friendship flows from love for critters and animals, and everything else that dwells in the forests. Yellow card effects include pump effects, where ponies and critters gain a sudden love boost, and lots of animals. Yellow friendship yields contains the most powerful, though uncomplicated, ponies and critters with the greatest love and tolerance. Famous for it’s ability to surprise players during faceoffs, Giant Kindness is sure to cause great amounts of fun being inflicted on other ponies and players, as well as ensuring that the targeted pony isn’t loved to death by too having much fun. Hard work is the tagline for the farm pony Applejack, and orange is her color. Representing the element of honesty, she keeps things straight. 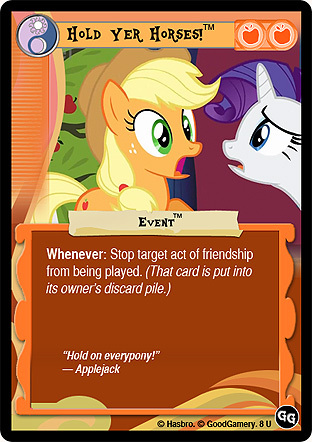 This might mean turning or unturning cards in play, and being a bit of a control freak (which little farm gal Apple Bloom can readily verify). Applejack will interrupt friends and ponies and tell them to think over what they’re doing, and will not hesitate to stop them from doing silly things. 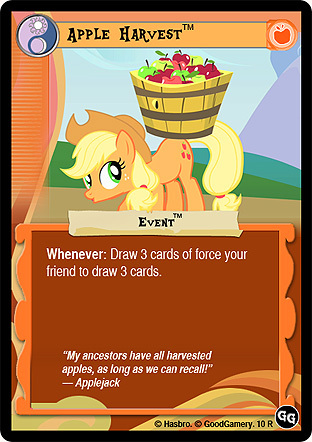 Apple Harvest is one of the more powerful orange cards, and demonstrates the power of hard work. Orange friendship is also the friendship of card draw, because true honesty is always rewarding. Represented by cool pegasus pony Rainbow Dash, blue is the color of winning. Rainbow Dash will do anything to win, and so will blue. Sometimes this means that blue will hurt others or steal things, and blue is also fond of pranks and enjoys being in a position of power and admiration. Though when it comes down to choosing between your friends and winning, blue will always put the spirit of loyalty to one’s friends first, and then win. Sometimes enough isn’t enough, and a sonic rainboom can enhance the friendship of loyalty by 300% in an instant. Interestingly enough: In the prerelease version of the game, this card was called a “friendship source”, but this was later changed. We think that’s pretty cool anyhow. Pinkie Pie’s color is the color of fun and it also represents the spirit of laughter. Pink wants to act on its desires quickly, and doesn’t to think ahead of consequences. Pink favors quick and direct fun, as well as pranking other ponies and forcing them to deal with the unexpected. Pink is also the color of chaos, and sometimes too much fun can hurt itself and others randomly. Though in the end, pink will always put friendship first. 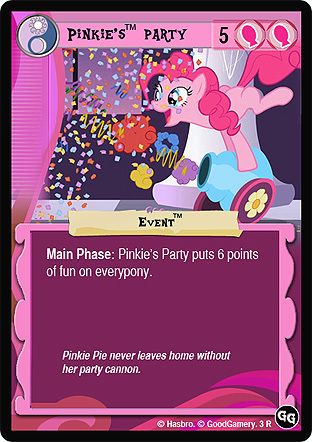 Pinkie Pie loves a good party, and certainly parties will cause everypony to have lots of fun. When Pinkie enters the dance floor, she turns it into one hoof of a disco inferno. Purple is the sixth color, and it’s the color of magic. Purple also represents the spirit of friendship, because friendship is magic. 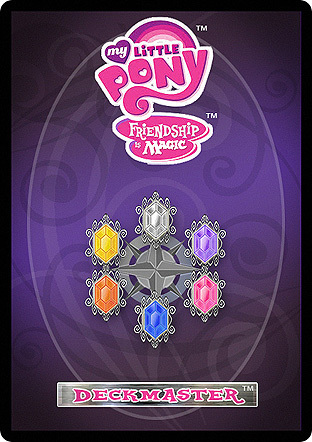 Purple friendship plays with the fabrics of Equestria and is able to manipulate time and space. This means that you and your friend will be seeing time-traveling cards, cards placed outside the game, reversed turn orders and additional game phases. Yes, unicorns can do that. Twilight Sparkle is a unicorn (at least in the first three seasons of MLP). Yes, this is Twilight Sparkle, first and best student to princess Celestia and later in the show, a princess herself. Obviously reading lots of books will cause all players to draw cards. As you would expect, there are a number of card types in the game with special properties, rules and purposes. We’ve briefly mentioned most of them earlier, but let’s dig in deeper in each card type. 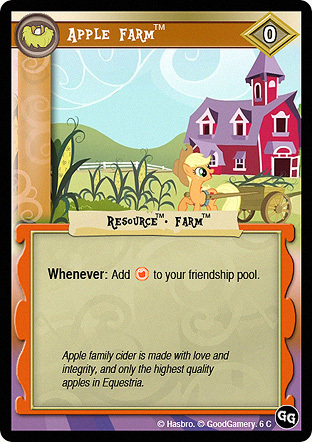 Resources are non-friendship cards, meaning that they don’t count as acts of friendship when you play them. Instead, friendship flows from resources when you exhaust them (turn them sideways). Resources don’t have friendship costs, but you only can play one each turn during the main phase. We’ve previously mentioned that playful ponies are the mane excitement in the game. 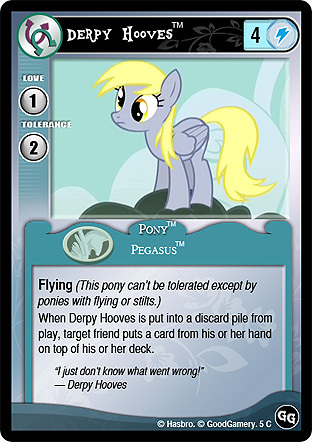 But we haven’t mentioned that ponies can have powerful abilities and keywords, such as Derpy Hooves (shown below) has. Derpy is a pegasus pony, so she can fly. It has implications for how she can interact with other ponies – and in this case, it’s obvious that Derpy can’t be tolerated by everypony. Events are things that happen that have effects on the game play when they are played. The card text specifies when the card can be played; at any time, or during the main phase. 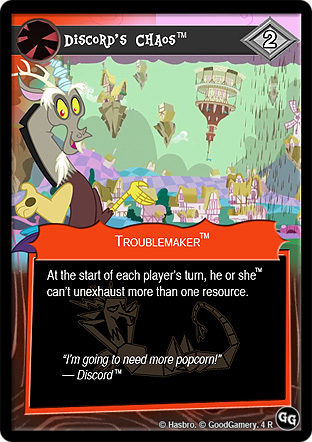 Troublemakers are cards that bring in trouble into the game. This might be useful in some cases, we guess, or Hasbro wouldn’t had put them into the game. We like Discord anyway, so why not? Getting rid of troublemakers can be a hassle, though. The friendship of generousity is the most successful at this, with cards like Distroublemake. Maneswalkers are powerful ponies that walk across the plains of Equestria. They don’t participate in play like ordinary ponies, but count as friends and have special abilities that are activated by adding or removing points. 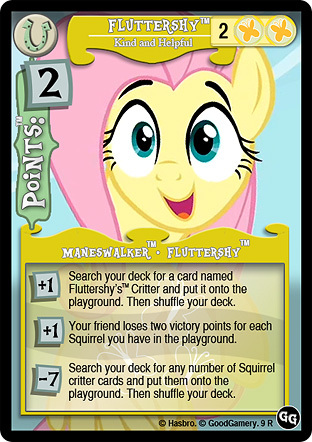 A player can choose to challenge a maneswalker with loving ponies, and if anypony puts some fun on the maneswalker, she loses that many points. 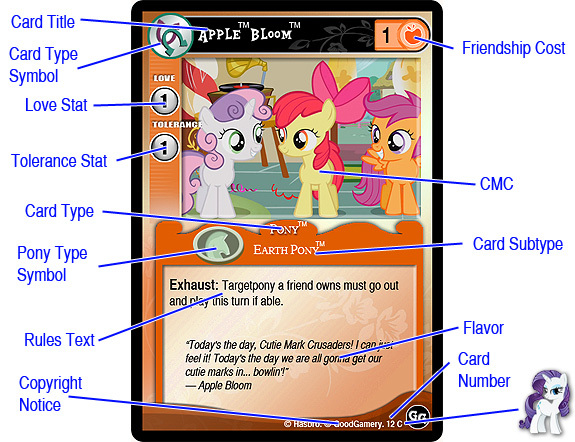 Text about the next article, where we dive deeper into enchanting problem cards and give a tour of My Little Pony Online (MLPO).